Flooding continues to plague parts of central and northern Alberta, with more evacuations issued in Woodlands County, Mackenzie County and park areas of Grande Prairie. More than 200 people have fled their homes in the northern Alberta hamlet of Fort Vermilion as the ice-choked Peace River prompted an expanded mandatory evacuation order for residents living in flood zones. Flooding continued to plague parts of central and northern Alberta through the weekend, particularly in Woodlands County, Mackenzie County and some of the park areas of Grande Prairie. A critical alert was issued Saturday for flooding in Mackenzie County, 800 kilometres northwest of Edmonton. This is the province's largest county and includes the communities of Fort Vermilion, High Level, La Crete and Zama City. 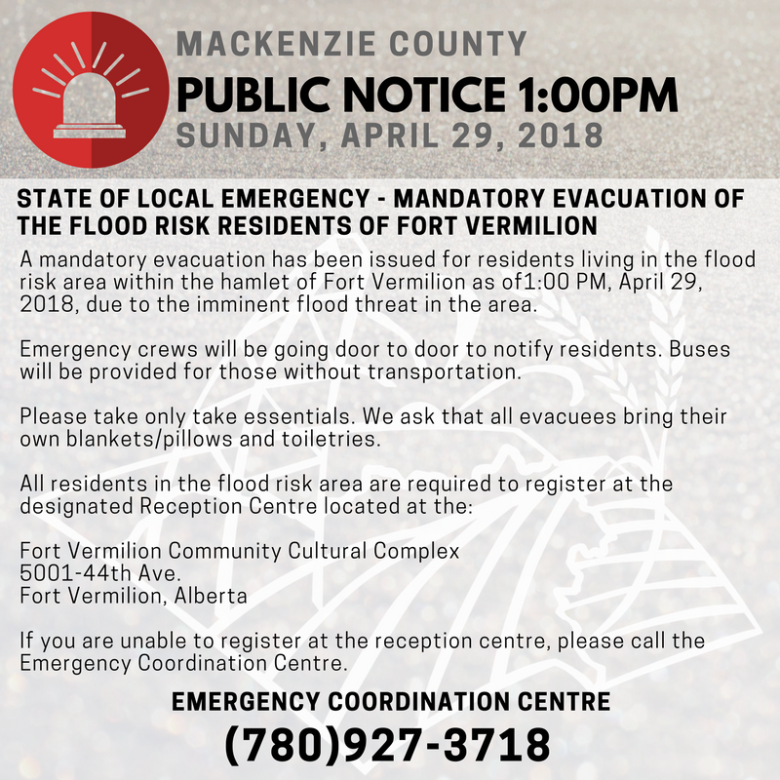 On Sunday afternoon, a local state of emergency was declared and a mandatory evacuation was issued for residents who live in a flood risk area of Fort Vermilion, also known as Buttertown. By Sunday evening, the rising water forced the closure of the Peace River Bridge Crossing on Highway 88 and the evacuation order was expanded to four affected zones. By early evening, more than 200 people had checked in to the reception centre. In the evacuation notice, they had been asked to only take the essentials, as well as their own blankets, pillows and toiletries. The county also announced later Sunday night that the reception centre had been moved to the Fort Vermilion Public School. 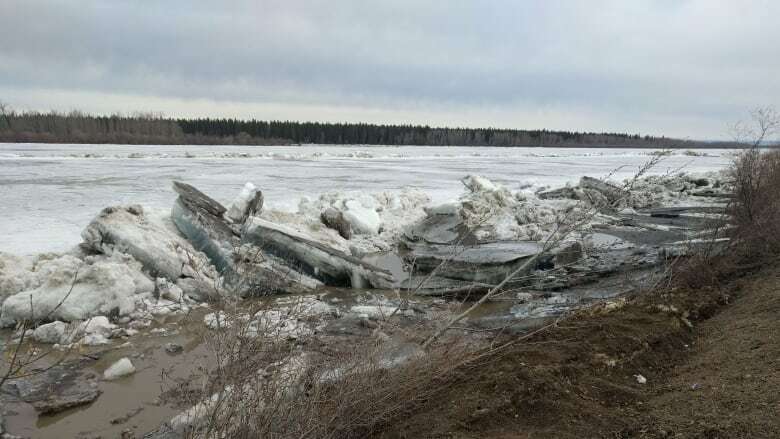 The flooding is due to ice jams on the Peace River — ice backs up the river, and when it moves or is released, the water levels rise rapidly downstream. The bridge was open late Sunday night, but officials were warning that it could be closed again if necessary. On Sunday morning, Mackenzie County spokesman Byron Peters said the river had risen about two metres in one hour Sunday morning, and that officials were watching it closely. Elsewhere in the province, a critical alert due to high water levels and flooding remains in effect for Woodlands County, around 150 kilometres northwest of Edmonton. Six homes were evacuated a few kilometres east of Fort Assiniboine due to high water levels, Woodlands County spokesman Luke Mercier said Sunday morning. Ice jams on the Athabasca River have created the high water levels, which have risen rapidly in the Pride Valley area. Aerial footage Saturday shows severe flooding over Flats Road near Whitecourt in Woodlands County, where 10 people were forced to leave their homes on Saturday. The road remains closed due to localized flooding. Twenty-six roads are closed in the Municipal District of Greenview and 64 hazardous areas are being monitored, but no evacuations are in place. 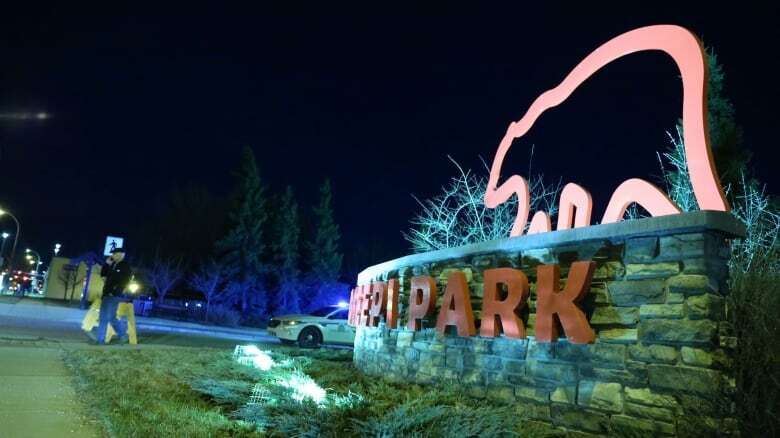 Muskoseepi Park and the Bear Creek corridor were evacuated Saturday night in Grande Prairie due to elevated water levels. Many paths are underwater and the creek banks are unstable, but no properties were damaged, the Grande Prairie Emergency Coordination Centre said Saturday night in a media release. "It's quite a large area," RCMP Supt. Don McKenna said Saturday night, adding the water levels did appear to be falling. The park will remain closed until the water recedes. The public is asked to stay away from the area. "It's quite dangerous," McKenna said. "We don't want anyone to get hurt, anyone to get swept away." For the latest updates on flood alerts in Alberta, visit Alberta Emergency Alert.